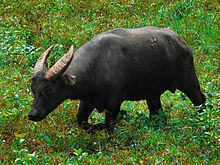 The tamaraw or Mindoro dwarf buffalo (Bubalus mindorensis) is a small hoofed mammal belonging to the family Bovidae. It is endemic to the island of Mindoro in the Philippines, and is the only endemic Philippine bovine. It is believed, however, to have once also thrived on the larger island of Luzon. The tamaraw was originally found all over Mindoro, from sea level up to the mountains (2000 meters above sea level), but because of human habitation, hunting, and logging, it is now restricted to only a few remote grassy plains and is now a critically endangered species. Contrary to common belief and past classification, the tamaraw is not a subspecies of the local carabao, which is only slightly larger, or the common water buffalo. In contrast to the carabao, it has a number of distinguishing characteristics: it is slightly hairier, has light markings on its face, is not gregarious, and has shorter horns that are somewhat V-shaped. It is the second largest native terrestrial mammal in the country next only to the Carabao. Bubalus mindorensis has the appearance of a typical member of its family. It has a compact, heavyset, bovine body, four legs that end in cloven hooves and a small, horned head at the end of a short neck. It is smaller and stockier compared to the water buffalo (Bubalus bubalis). There is little sexual dimorphism in the species although males are reported to have thicker necks. The tamaraw has an average shoulder height of 100–105 cm (39–41 in). The length of the body is 2.2 m (7.2 ft) while the tail adds a further 60 cm (24 in). Reported weights have ranged from 180 to 300 kg (400 to 660 lb). Adults have a dark brown to grayish color and more hair than Bubalus bubalis. The limbs are short and stocky. White markings are seen in the hooves and the inner lower forelegs. These markings are similar to that of the anoa (Bubalus depressicornis). The face is the same color as that of the body. Most of the members of the species also have a pair of gray-white strips that begins from the inner corner of the eye to the horns. The nose and lips have black skin. The ears are 13.5 centimetres (5.3 in) long from notch to tip with white markings on the insides. Both sexes grows short black horns in a V-shaped manner compared to C-shaped horns of Bubalus bubalis. The horns have flat surfaces and are triangular at their base. Due to the regular rubbing, the tamaraw's horns have a worn outer surface but with rough inner sides. The horns are reported to be 35.5 to 51 centimetres (14.0 to 20.1 in) long. The tamaraw was first documented in 1888 on the island of Mindoro. Before 1900, most people avoided settling on Mindoro due to a virulent strain of malaria. However, as anti-malarial medicine was developed, more people settled on the island. The increase in human activity has drastically reduced tamaraw population. By 1966 the tamaraw's range was reduced to three areas: Mount Iglit, Mount Calavite and areas near the Sablayan Penal Settlement. By 2000, their range was further reduced to only two areas: the Mounts Iglit–Baco National Park and Aruyan. Initial estimates of the Bubalus mindorensis population on Mindoro was placed at around 10,000 individuals in the early 1900s. Less than fifty years later in 1949, the population had dwindled to around a thousand individuals. By 1953, fewer than 250 animals were estimated to be alive. These population estimates continually grew smaller until the IUCN publication of their 1969 Red Data Book, where the tamaraw population was noted to be an alarmingly low 100 heads. This head count rose to 120 animals in 1975. Current estimates place the wild tamaraw population from thirty to two hundred individuals. As a rare, endemic mammal on a relatively secluded island, the ecology of the tamaraw is largely unknown. Individuals of the species are reclusive and shy away from humans. In addition, the small sizes of the species' subpopulations, already spread thin throughout their fragmented range (on 1986, about 51 individuals are found in a 20 square kilometer area), make contact with any more than a solitary individual a rarity. Bubalus mindorensis prefers tropical highland forested areas. It is typically found in thick brush, near open-canopied glades where it may graze and feed on grasses. Since human habitation and subsequent forest fragmentation of their home island of Mindoro, the habitat preferences of the tamaraw have somewhat expanded to lower-altitude grassy plains. Within their mountainous environment, tamaraws will usually be found not far from sources of water. They have to live by water so they can drink. They live in moist areas such as marshy areas and grasslands. The tamaraw is a grazer that feeds on grasses and young bamboo shoots although it is known to prefer cogon grass and wild sugarcane (Saccharum spontaneum). They are naturally diurnal, feeding during the daytime hours; however, daytime human activities have recently forced select B. mindorensis individuals to be nocturnal to avoid human contact. The tamaraw is known to live for about 20 years, with an estimated lifespan of about 25. The adult female tamaraw gives birth to one offspring after a gestation period of about 300 days. There is an interbirth interval of two years, although one female has been sighted with three juveniles. The calf stays for 2–4 years with its mother before becoming independent. Unlike the closely related water buffalo, B. mindorensis is a solitary creature. Adults of the species do not occur in herds or smaller packs and are often encountered alone. Only juveniles exhibit the typical bovine herding behavior and clan hierarchy often seen in water buffalo. Males and females are known to associate all year round but this interaction lasts only a few hours. It has been suggested that this solitary behavior is an adaptation to its forest environment. Adult males are often solitary and apparently aggressive while adult females can be alone, accompanied by a bull, or three young of different ages. Similar to other bovines, the tamaraw wallows in mud pits. It has been suggested that this behavior is employed by the animals in order to avoid biting insects. Another distinct behavior in B. mindorensis is their fierceness. There are reports concerning their fierceness when cornered although most are unsubstantiated. Threat posture used by the bovine involves lowering of the head, shifting its horns into a vertical position. This is accompanied with a lateral shaking of the head. The presence of B. mindorensis on the island of Mindoro, coupled with the discovery of fossil bubalids in other islands around the archipelago indicates that the family was once widespread throughout the Philippines. In fact, fossil finds in the 20th century have shown that B. mindorensis were once found on the northern Philippine island of Luzon during the Pleistocene. As a member of the family Bovidae, the tamaraw's close affinity to the water buffalo (Bubalus bubalis) has been validated many times in the past. It was once considered a subspecies of B. bubalis (as Anoa bubalis), Anoa bubalis mindorensis. Recent genetic analysis studies of the family members further strengthen this view. The tamaraw was originally described as Anoa mindorensis by the French zoologist Pierre Marie Heude in 1888. In 1958, it was described as Anoa bubalis mindorensis, a subspecies of the then-water buffalo species (Anoa bubalis). A little over a decade after, the tamaraw was elevated to species status as Anoa mindorensis in 1969. Later research and analyses of relationships determined the genus Anoa to be a part of the genus Bubalus. The tamaraw's scientific name was updated into its present form, Bubalus mindorensis (sometimes referred to as Bubalus (Bubalus) mindorensis). The name tamaraw has other variants like tamarau, tamarou and tamarao. It has been suggested that the term tamaraw came from tamadaw which is a probable alternative name for the banteng (Bos javanicus). Being an entirely endemic and rare land mammal, Bubalus mindorensis stands as an extremely vulnerable species. Currently, it is classified as a critically endangered species and has been so since 2000 by the IUCN on its IUCN Red List of endangered species. Awareness of the conservation status of Bubalus mindorensis began in 1965 when it was classified as Status inadequately known by the IUCN. Enough data was gathered on the tamaraw population by 1986, and the IUCN conservation monitoring center declared the species endangered. Throughout succeeding surveys conducted in 1988, 1990, 1994 and 1996, the species remained listed on the Red List as endangered. The relisting of the species in 1996 fulfilled the IUCN criteria B1+2c and D1. Criterion B1 indicated that the species' range was less than 500 square kilometers and is known to exist in less than five independent locations. A noticed continuing decline in the population fulfilled sub-criterion 2c, given the condition of the population's sole habitat. Criterion D1 essentially required that a population be composed of less than 250 mature individuals; individual counts of the B. mindorensis population at the time figured significantly lower than this. In 2000, the tamaraw was relisted on the Red List under the more severe C1 criteria. This was due to estimates that the population would decline by 20% in five years or within the timespan of two generations. Many factors have contributed to the decline of the tamaraw population. Over the course of the century, the increase of the human population on Mindoro has exposed the island's sole tamaraw population to severe anthropogenic pressures. In the 1930s, the introduction of non-native cattle on the island caused a severe rinderpest epidemic among the tamaraw population then-numbering in the thousands. Hunting of tamaraws for food and sustenance has also taken a toll on the species' numbers. The most major factor threatening survival of B. mindorensis is habitat loss due to infrastructure development, logging and agriculture. These factors reduced the population of thousands during the early 1900s to less than 300 individuals in 2007. Due to the decline of the B. mindorensis population, various Philippine laws and organizations have been created towards the conservation of the species. In 1936, Commonwealth Act No. 73 was enacted by the then-Philippine Commonwealth. The act specifically prohibited killing, hunting and even merely wounding tamaraws, with an exception noted for self-defense (if one were to be attacked by an agitated individual) or for scientific purposes. The penalties were harsh enough to include a hefty fine and imprisonment. In 1979, an executive order was signed creating a committee specifically geared towards the conservation of the tamaraw. The tamaraw was referred to as a "source of national pride" in the said E.O. The Tamaraw Conservation Project was also established in 1979. The organization has successfully bred a tamaraw, nicknamed "Kali", in captivity in 1999. In 2001, Republic Act 9147, or the Wildlife Resources Conservation and Protection Act was enacted to protect the tamaraw and other endemic species from hunting and sale. During the 1970s, a gene pool was established to preserve the tamaraw's numbers. However, the project was not successful as only one offspring, named "Kali", was produced. As of 2011, Kali is the only surviving animal in the gene pooling project. The project was also not improved as the Protected Areas and Wildlife Bureau showed that the tamaraws were already breeding in the wild. Cloning was not implemented for conservation as the Department of Environment and Natural Resource argued that such measures would diminish the genetic diversity of the species. A small subpopulation of tamaraw has been found within the confines of the Mt. Iglit Game Refuge and Bird Sanctuary on the same island of Mindoro. As of May 2007, Bubalus mindorensis is on Appendix I of the Convention on International Trade in Endangered Species where it has been since the species was first put on the list on January 7, 1975. With the listing, CITES recognizes the species as critically endangered and threatened with extinction. Thus, international commercial trade in the species or any derivatives of which, such as meat or horns is considered illegal. While commercial trade in the species is prohibited, exchange for non-commercial reasons such as scientific research is allowed. In October 2008, the Department of Agriculture's Philippine Carabao Center (DA-PCC) director, Dr. Arnel del Barrio, officially reported that the tamaraw population had increased yearly by an average of 10% from 2001 to 2008. The April 2008 tamaraw expedition reports of the Tamaraw Conservation Program (Mt. Iglit-Baco National Park in Mindoro Occidental), by government and private entities, including Far Eastern University (FEU) students, revealed that "the tamaraw population was counted at 263 this year compared to only 175 heads in 2001. The calving rate estimated by number of yearlings is considerably high... (which could mean that) more than 55% of the tamaraws are giving birth. In Mount Iglit-Baco National Park, the official count of the animal was 263 in 2006, 239 in 2007 and 263 in 2008." Mindoro's indigenous Mangyan people have stopped slaughtering the animal for its blood. The Haribon Foundation called the animal "Mindoro’s endangered treasure" and later "the Philippines’ endangered flagship species" until 2005. In the 1930s the tamaraw population declined due to rinderpest, a viral disease affecting cattle. In the 1960s and 1970s, hunters killed tamaraws for sport. More importantly, the rampant deforestation (from 80% habitat forest cover in the 1900s down to 8% in 1988) in the area hastened the animal's decline. The Bangkok, Thailand International Union for the Conservation of Species (IUCS) has established a 280-hectare gene pool farm in Rizal, Mindoro Occidental. Also, extensive reforestation was implemented to hasten the tamaraws' propagation. The animals are now found only in the mountainous portions of Mt. Iglit-Baco National Park, Mt. Calavite, Mt. Halcon-Eagle Pass, Mt. Aruyan-Sablayan-Mapalad Valley, and Mt. Bansud-Bongabong-Mansalay. The 2002 Presidential Proclamation 273 set October as a "Special Month for the Conservation and Protection of the Tamaraw in Mindoro.". At least 90% belong to Mount Iglit-Baco. To this day there are about 100 left, facing human-induced extinction. While not as heavily exploited as other large, endangered mammals, the tamaraw population on Mindoro was subject to some harvesting pressure from subsistence hunters before conservation efforts were spurred towards the latter half of the 20th century. The IUCN has described this as still ongoing in their 2006 Red List report. The tamaraw on an out-of-circulation edition of the 1-peso coin. Though the national animal of the Philippines is the carabao, the tamaraw is also considered a national symbol of the Philippines. An image of the animal is found on the 1980-to-early-1990 version of the one-peso coins. In 2004, Proclamation No. 692 was enacted to make October 1 a special working holiday in the province of Occidental Mindoro. In line with the Tamaraw Conservation Month, the proclamation aimed to remind the people of Mindoro the importance of the conservation of the tamaraw and its environment. In the 1970s Toyota Motors, through the defunct local company Delta Motors, built the Tamaraw AUV (Asian Utility Vehicle). Because of its ruggedness and simplicity of design, some examples still survive to this day, copied by multinational companies Ford, General Motors, and Nissan, through local subsidiary manufacturers to this day. Because it is an Asian Utility Vehicle, it shares its design with the Kijang, the Indonesian version. Automobile maker Toyota once held a franchise in the Philippine Basketball Association, naming its team the Toyota Tamaraws (see below). During the wake of the Asian utility popularity in the 1990s, Toyota Motors Philippines released an Asian Utility Vehicle) called Tamaraw FX in the Philippines, an evolution of the Tamaraw AUV. It was widely patronized by taxi operators and was immediately turned into a staple mode of transportation much like a cross of the taxi and the jeepney. The FX eventually evolved into the Revo. The tamaraw is also the mascot of the varsity teams of the Far Eastern University (FEU Tamaraws) in the University Athletic Association of the Philippines, and of the Toyota Tamaraws of the Philippine Basketball Association. The Tamaraw Falls in Barangay Villaflor, Puerto Galera were also named after the bovine. ^ Hedges, S.; Duckworth, J.W. ; Huffman, B.; de Leon, J.; Custodio, C. & Gonzales, J. (2013). "Bubalus mindorensis". IUCN Red List of Threatened Species. Version 2014.1. International Union for Conservation of Nature. Retrieved 24 November 2014. ^ "Bubalus mindorensis". Integrated Taxonomic Information System. Retrieved 17 March 2007. ^ a b c d e f Hedges (2000). "Bubalus mindorensis". IUCN Red List of Threatened Species. Version 2006. International Union for Conservation of Nature. Retrieved 11 May 2006. ^ a b c d e f Fuentes, Art (21 February 2005). "The Tamaraw: Mindoro's endangered treasure". Haribon. Haribon Foundation for the Conservation of Natural Resources. Retrieved 2007-03-17. ^ "Tamaraw bubalus mindorensis Heude, 1888". wildcattleconservation.org. Retrieved 2007-07-12. ^ Custodio, Carlo C.; Myrissa V. Lepiten; Lawrence R. Heaney (17 May 1996). "Bubalus mindorensis" (PDF). Mammalian Species. American Society of Mammalogist. 520: 1–5. doi:10.2307/3504276. Retrieved 4 October 2012. ^ a b c Massicot, Paul (5 March 2005). "Animal Info - Tamaraw". Animal Info. Retrieved 2007-03-18. ^ Kuehn, David W. (1977). "Increase in the tamaraw". Oryx. 13 (05): 453 pp. doi:10.1017/S0030605300014472. ISSN 0030-6053 / EISSN 1365-3008. ^ "Major effort to save the tamaraw". Oryx. 23: 126 pp. 1989. doi:10.1017/S0030605300022821. ISSN 0030-6053 / EISSN 1365-3008. ^ a b Nowak, Ronald M. (1999). Walker's Mammals of the World. JHU Press. p. 1149. ISBN 0-8018-5789-9. ^ a b Kuehn, David W. (Sep 1986). "Population and Social Characteristics of the Tamarao (Bubalus mindorensis)". Biotropica. The Association for Tropical Biology and Conservation. 18 (3): 263–266. doi:10.2307/2388495. JSTOR 2388495. ^ McMillan, Brock R.; Michael R. Cottam; Donald W. Kaufman (July 2000). "Wallowing Behavior of American Bison (Bos bison) in Tallgrass Prairie: an Examination of Alternate Explanations". American Midland Naturalist. The University of Notre Dame. 144 (1): 159–167. doi:10.1674/0003-0031(2000)144[0159:WBOABB]2.0.CO;2. JSTOR 3083019. ^ Croft, Darin A.; Lawrence R. Heaney; John J. Flynn; Angel P. Bautista (3 August 2006). "Fossil remains of a new, diminutive Bubalus (Artiodactyla: Bovidae: Bovini) from Cebu island, Philippines". Journal of Mammalogy. American Society of Mammalogists. 87 (5): 1037–1051. doi:10.1644/06-MAMM-A-018R.1. Retrieved 2007-03-17. ^ Burton, J. A.; S. Hedges; A. H. Mustari (2005). "The taxonomic status, distribution and conservation of the lowland anoa Bubalus depressicornis and mountain anoa Bubalus quarlesi". Mammal Review. 35 (1): 25–50. doi:10.1111/j.1365-2907.2005.00048.x. Retrieved 2007-03-17. ^ Beyer, H. O. (1957). "New finds of fossil mammals from the Pleistocene strata of the Philippines". Bulletin of the National Research Council of the Philippines. National Research Council of the Philippines. 41: 220–238. ^ a b Bohlken, H. (1958). "Vergleichende Untersuchungen an Wildrinden (Tribus Bovini Simpson, 1945)". Zoologische Jahrbücher (Physiologie). 68: 113–202. ^ Wall, David A.; Scott K. Davis; Bruce M. Read (May 1992). "Phylogenetic Relationships in the Subfamily Bovinae (Mammalia: Artiodactyla) Based on Ribosomal DNA". Journal of Mammalogy. American Society of Mammalogists. 73 (2): 262–275. doi:10.2307/1382056. JSTOR 1382056. ^ Groves, C. P. (1969). "Systematics of the anoa (Mammalia, Bovidae)". Beaufortia. 223: 1–12. ^ "Bubalus mindorensis". Mammal Species of the World (MSW). Smithsonian National Museum of Natural History. 1993. Archived from the original on October 19, 1996. Retrieved 2007-03-17. ^ Blust, Robert (2005). "The History of Faunal Terms in Austronesian Languages" (PDF). Oceanic Linguistics. 41: 89–140. doi:10.1353/ol.2002.0016. Retrieved 2007-03-19. ^ "An act to prohibiting the killing, hunting, wounding or taking away of Bubalus mindorensis, commonly known as tamaraw". Commonwealth Act No. 73. National Assembly of the Philippines. 23 October 1936. Retrieved 2007-03-18. ^ Marcos, Ferdinand E. (9 July 1979). "Creating a presidential committee for the conservation of the tamaraw, defining its powers and for other purposes". Executive Order No. 544. Republic of the Philippines. Retrieved 2007-03-18. ^ "Republic Act No. 9147". Retrieved 2007-03-05. ^ "Philippines : Endangered Tamaraws breed in the wilds again". Archived from the original on March 18, 2012. Retrieved 2007-03-08. ^ CITES (3 May 2007). "Appendices". Convention on International Trade in Endangered Species of Wild Flora and Fauna. Archived from the original (shtml) on 2007-07-09. Retrieved 2007-08-03. ^ UNEP-WCMC. "Bubalus mindorensis". UNEP-WCMC Species Database: CITES-Listed Species. United Nations Environment Programme - World Conservation Monitoring Centre. A-119.009.004.003. Archived from the original on September 30, 2007. Retrieved 2007-08-03. ^ "Tamaraws no longer on brink of extinction, say conservationists". GMANews Online. 3 October 2008. Retrieved 4 October 2012. ^ goodnewspilipinas.com (11 October 2008). "Saving the Tamaraws from extinction". Inquirer.net. Archived from the original on July 12, 2014. Retrieved 4 October 2012. ^ "Philippines Independence Day Celebrations". National Symbol. 123independenceday.com. Retrieved 2007-03-29. ^ Breithaupt, Jan (29 April 2003). "Bubalus mindorensis, Philippines". EcoPort Picture Databank. EcoPort. Retrieved 2007-03-29. ^ "Proclamation No. 692" (Press release). Government of the Republic of the Philippines. 13 August 2004. Archived from the original on 3 August 2007. Retrieved 2007-07-28. "Bubalus mindorensis". Integrated Taxonomic Information System. Retrieved 17 March 2007. Custodio, Carlo C.; Myrissa V. Lepiten; Lawrence R. Heaney (17 May 1996). "Bubalus mindorensis". Mammalian Species. American Society of Mammalogists. 520 (520): 1–5. doi:10.2307/3504276. JSTOR 3504276. Gesch, P. (2004). "Bubalus mindorensis". Animal Diversity Web. University of Michigan Museum of Zoology. Retrieved 2007-03-17. Heaney, L. R.; J. C. Regalado Jr. (1998). Vanishing treasures of the Philippine rain forest. Chicago, Illinois: Field Museum, Chicago. Momongan, V. G.; G. I. Walde (1993). "Behavior of the endangered tamaraw (Bubalus mindorensis huede) in captivity". Asia Life Sciences. 2 (2): 241–350.